La Marzocco has done it again and created an innovative way for easier shot-pulling and clean-up. Made of solid stainless steel, the La Marzocco Stainless Steel Portafilter with Breakaway Spout will keep consistent heat even after a number of uses. What's more, any espresso cake build-up wipes off easily and won't leave stains on your portafilter head. La Marzocco's Stainless Steel Portafilter also features removable snap on or snap off spouts to help you achieve ultra even shots, plus a flat tamping stand on its tip so you can place it on the counter for a more stable and even tamp. Part number L111/2NAC. Stainless Steel Portafilter: No matter how many shots you pull, unlike the original chrome-plated brass portafilter, you'll still be able to wipe this portafilter clean. It will leave no trace of espresso puck stains. Break Away Spouts: Giving you the ability to clean inside and out, these spouts are easily able to snap on and off, preventing any espresso ground build up. Tamping Stand: Unlike other portafilters, this one gives you a flat surface at the tip of the portafilter that gives you a more stable surface to place on your countertop, giving you a more even tamp. 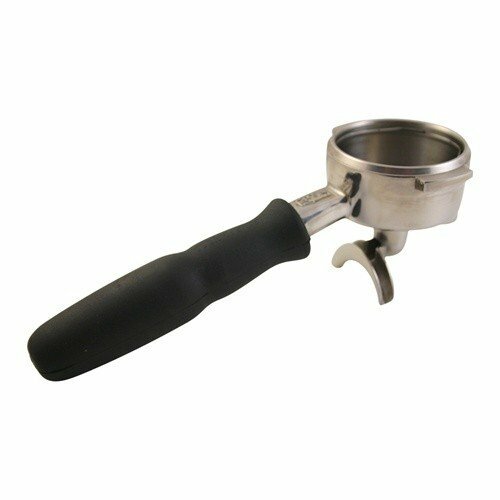 Compatibility: This portafilter will fit any and every type of La Marzocco Espresso Machine. Light Weight: Compared to the original La Marzocco portafilter, this portafilter is 10% lighter in weight.